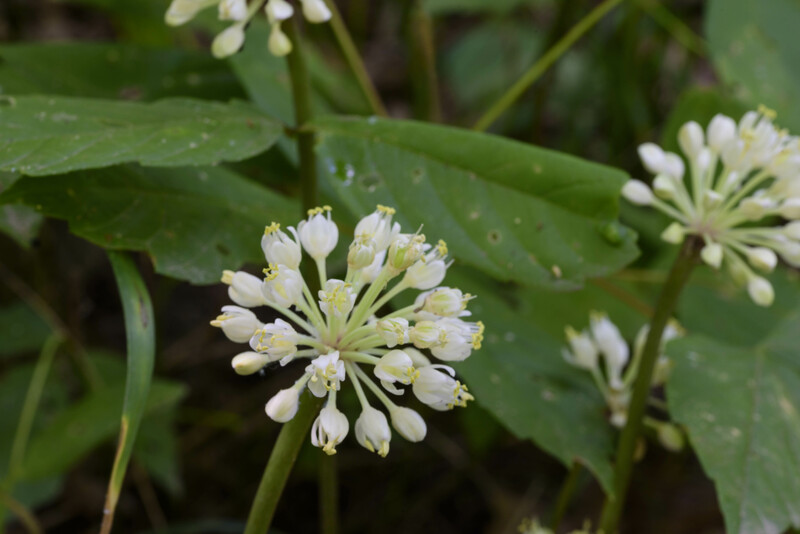 There aren’t many wildflowers to see at this time of year, but in a few spots the woods are bright with short, white balls-on-sticks. 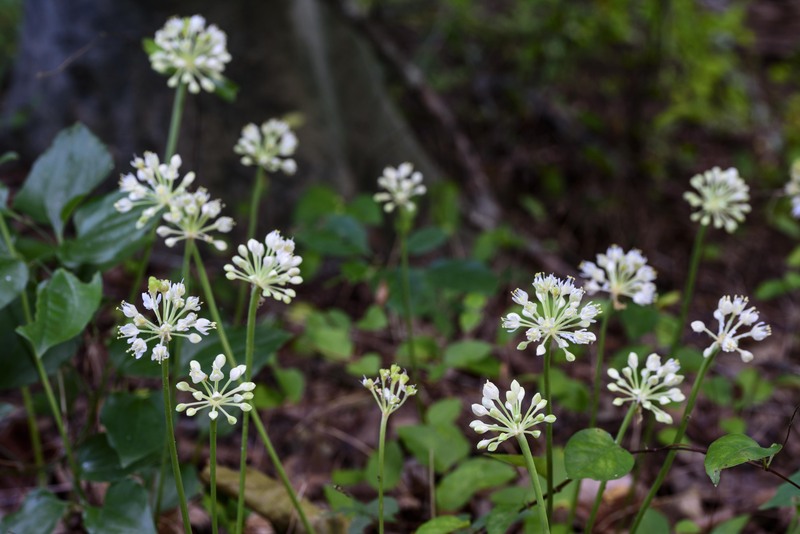 I have a confession to make that some of my friends will find surprising: foodie Elizabeth does not love the taste of ramps, aka wild leek (Allium tricoccum, Liliaceae). However, wildflower enthusiast Elizabeth loves the flowers. Or at least the look of them, because they do smell like onion. 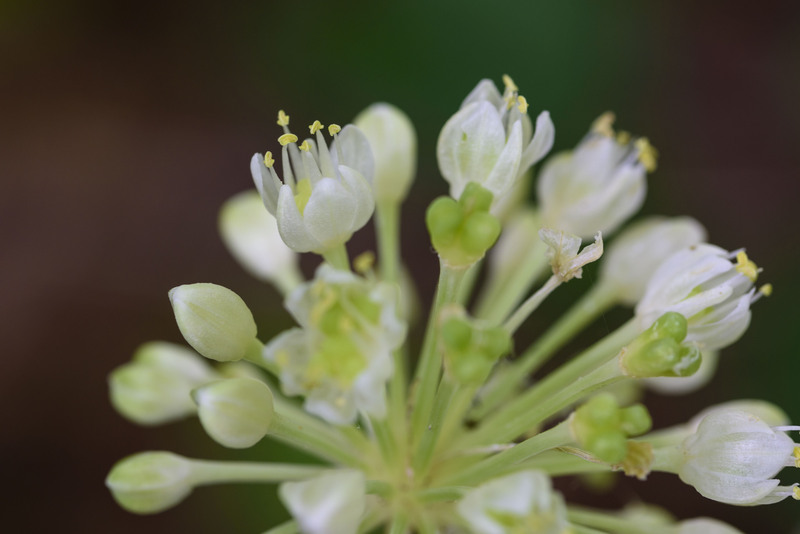 Each flower has six tepals, six stamens, and a single style. 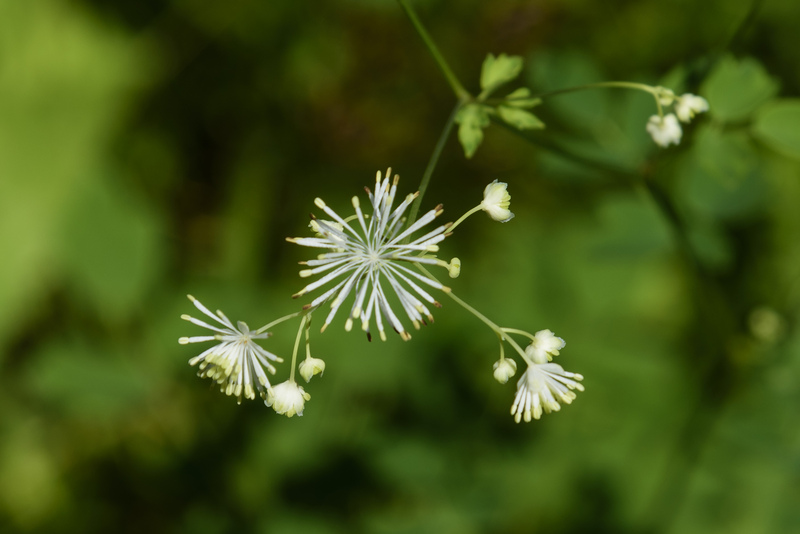 Multiple flowers are arranged on each umbel, which tops a single leafless stalk, making the plants look like balls on sticks. They stand about a foot tall. 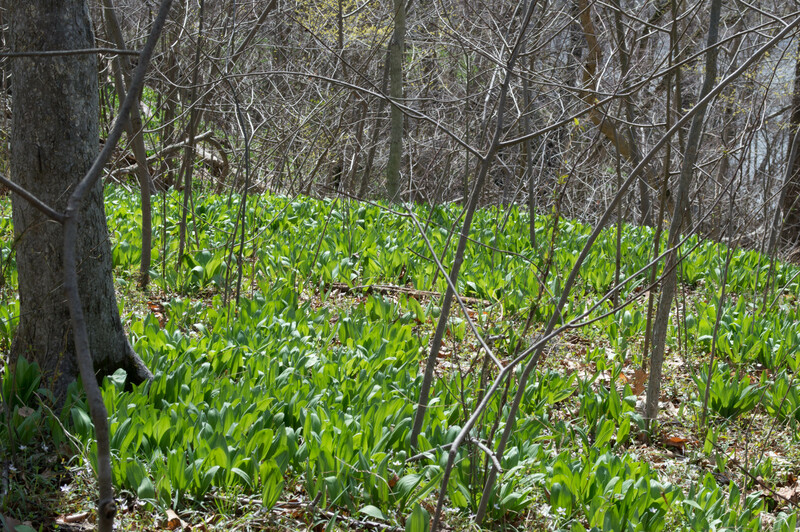 In the springtime, of course, ramps are all leaves, but the leaves die back before the flowering stalk emerges. 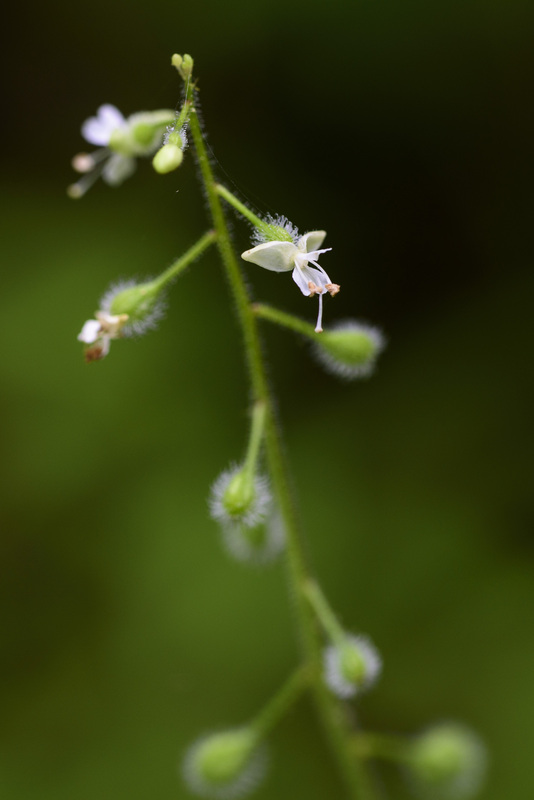 They do light up the understory. 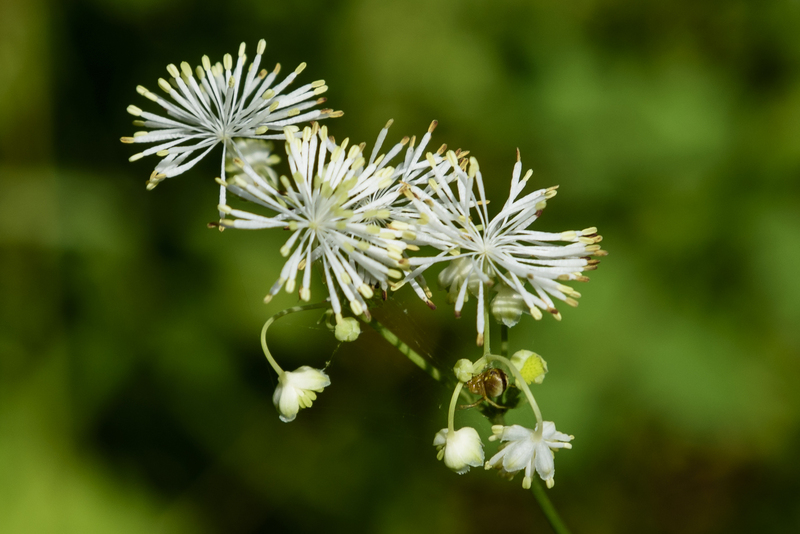 Ramps are listed as special concern in Maine and Rhode Island, special concern commercially exploited in Tennessee, and noxious weed in Arkansas, which is interesting considering that neither USDA PLANTS Database or BONAP have records for ramps anywhere in that state. 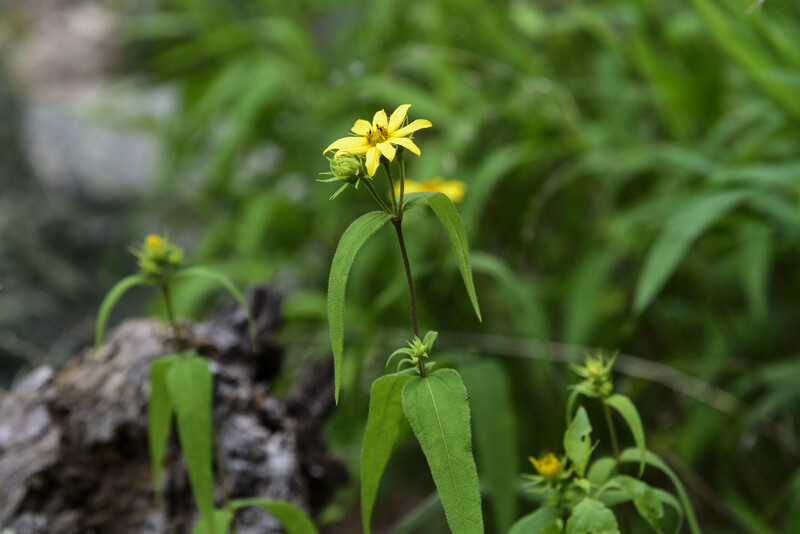 This past Tuesday I had a great idea: go botanizing on Olmstead Island and submit photos to the Maryland Biodiversity Project and the Maryland Plant Atlas. But a bunch of signs along the last stretch of road before the visitors’ center parking lot proclaimed that the walkway to the Great Falls overlook was closed. It won’t open until some time in July. Apparently repairs are needed. No problem, I can go back another day. Maryland Biodiversity Project (MBP) is a 501(c)3 non-profit organization focused on cataloging all the living things of Maryland. To do this, they accept recorded sightings (preferably photographic) off animals and plants (and fungi, etc. ), with specific locations: not just by county, but by USGS quad. There are 261 quads covering the state! 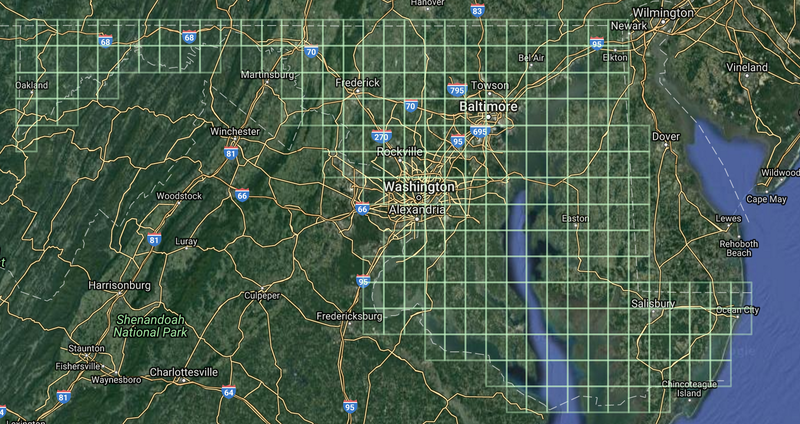 Click on any quad on the Maryland Plant Atlas quad map and you can see what’s already been recorded, and what the top 100 needs are. Because of the way the quads are arrayed over the state, some of them have very few or even no records. 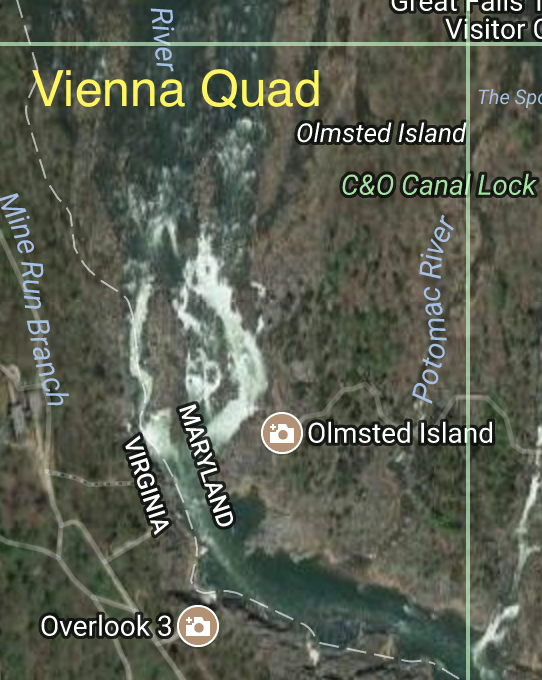 One of those quads is Vienna, which has only a sliver of Maryland in it: part of Olmstead Island, where the Great Falls overlook is. 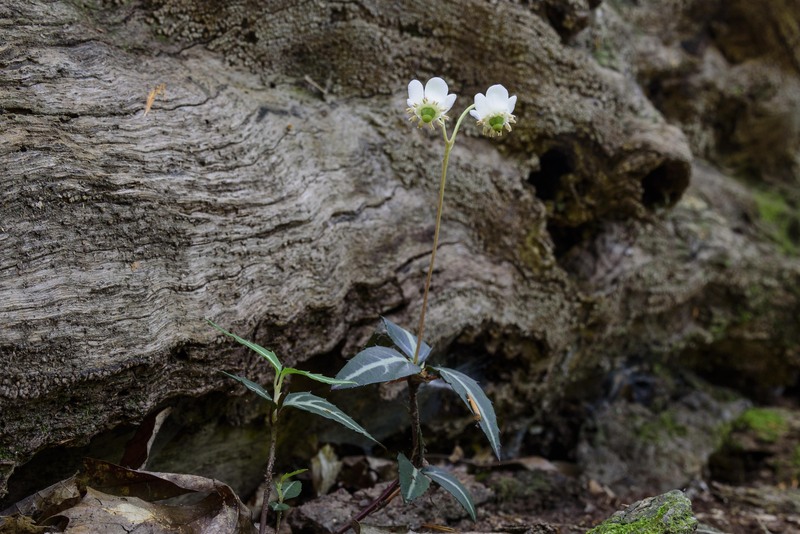 There are only seven records for that area; I can assure you there are a lot more than seven plant species there! So, sometime in July, when the walkway re-opens, I’m going to lead a mini bio-blitz and see if I can’t submit more photos to help fill in that quad. 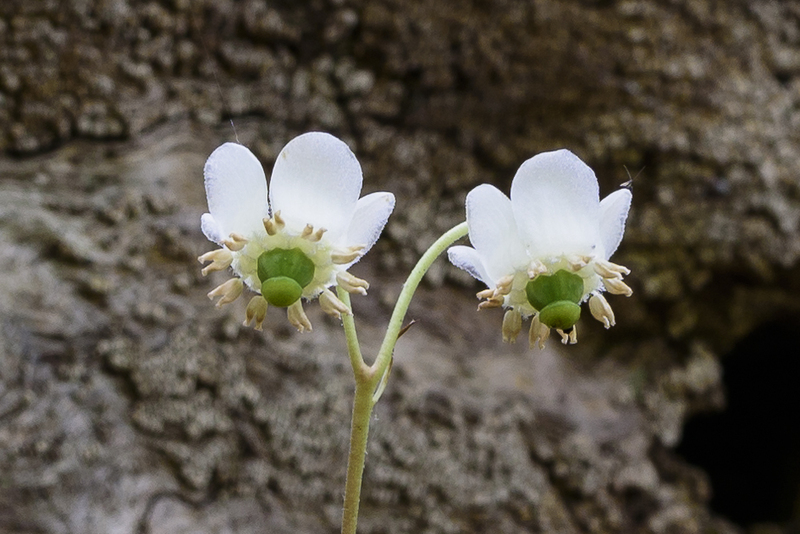 I’ll be posting about it on the MBP facebook page and the Maryland Native Plant Society Discussion Group, so if you want to join me, check those spaces for announcements. Or leave a message in the comments of this post. For more information about how to get involved with MBP, visit the FAQs page. It really is a lot of fun – like a scavenger hunt. One of those stands of irises that I keep writing about is in a depression in the woods that in most years is a vernal pond. Last year was dry, though, and the rain we’ve had so far this year doesn’t seem enough to bring groundwater levels back to normal. At any rate, that sometimes-vernal pond has only a few irises, but it’s absolutely dominated by this plant. There are two other stands I know of, one near the Carderock climbing wall, and the other near the Old Angler’s Inn footbridge, which is where I took these photos. This stand seems to be in shade for much, but not all, of the day, while the other stands are pretty much in full shade, all the time. Lizard’s tail forms large colonies by rhizomes. 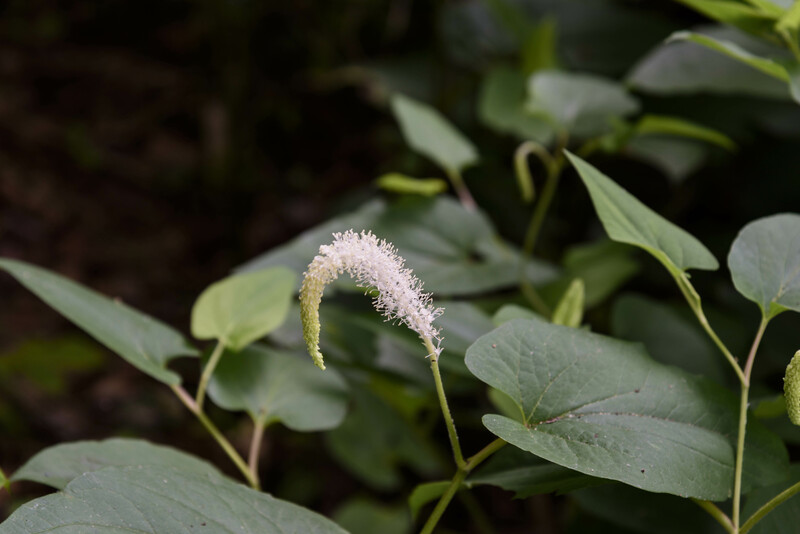 The plants stand up to three feet tall, with large, heart-shaped leaves and curved spikes of white flowers. 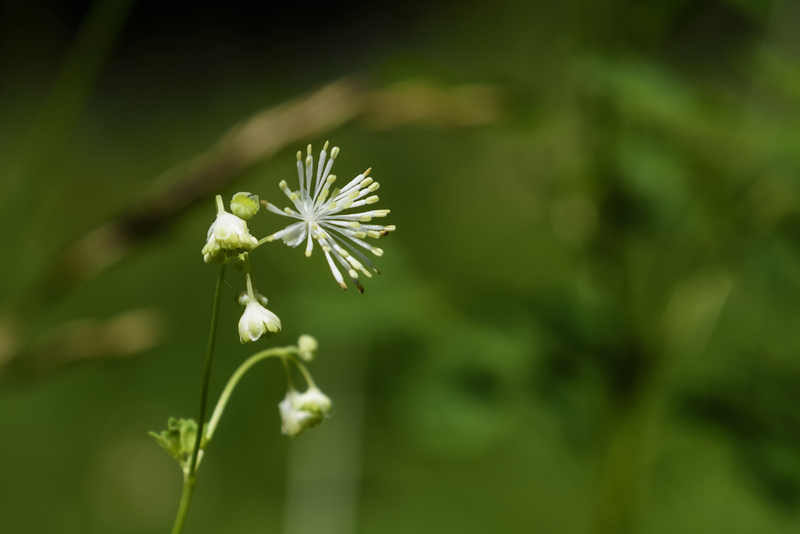 Each flower consists of stamens and a single pistil, without petals or sepals. Saururus is a genus with only two species; the other, S. chinensis, is native to Asia. The Saururaceae is a small family, with only seven species in five genera. S. cernuus ranges from Texas to Quebec, though it’s missing from much of New England. 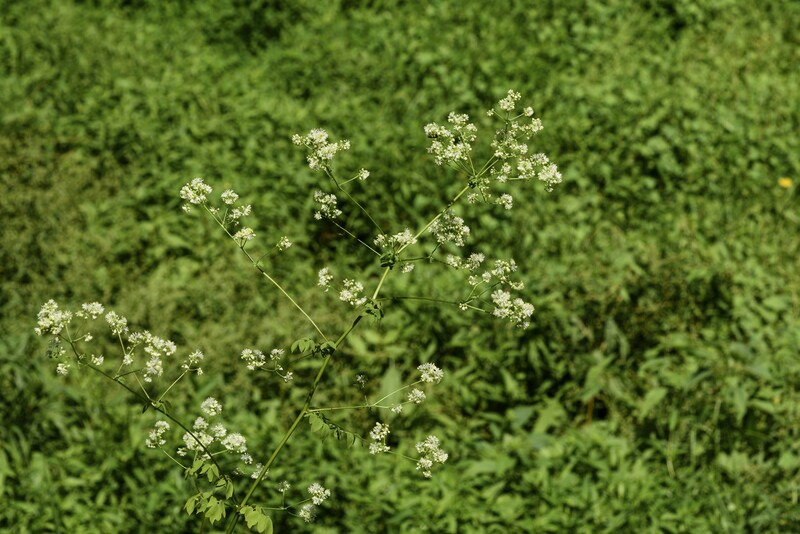 In Maryland it’s found in every county except for Frederick and Garret; I wouldn’t be surprised if it grows in those places as well, but no one’s reported it yet. 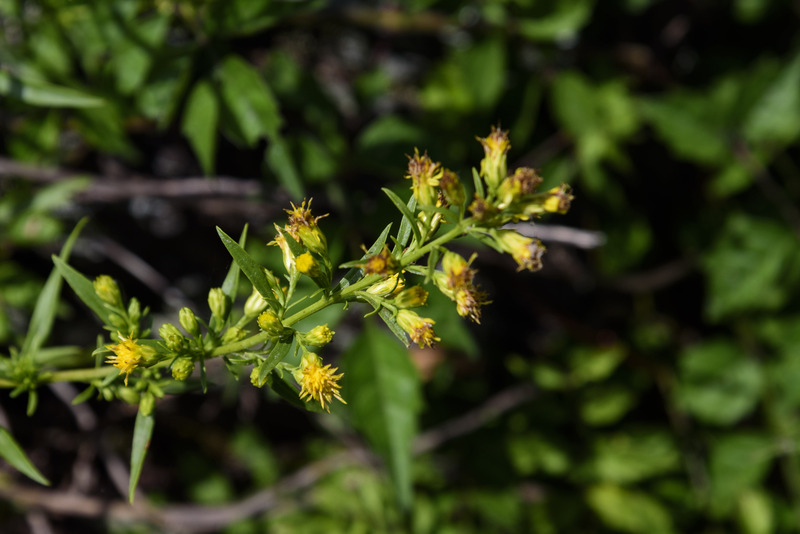 It’s endangered in Connecticut and Rhode Island, but listed as weedy by the Southern Weed Science Society. 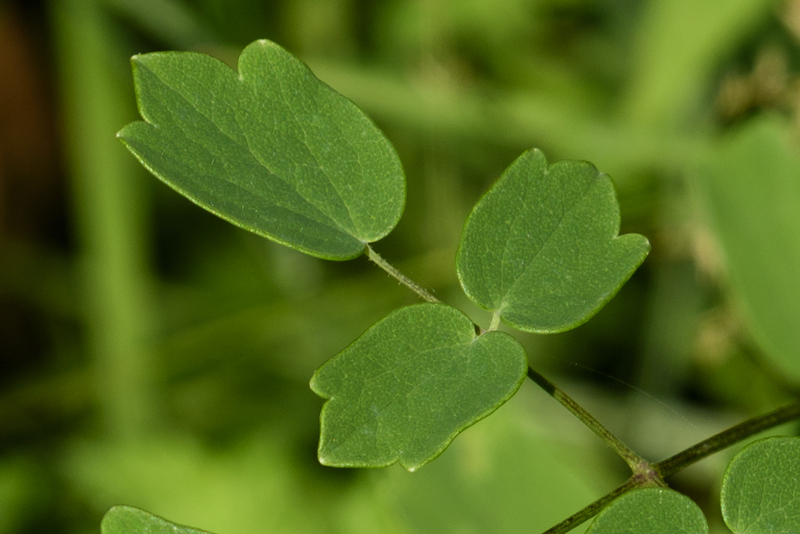 For once, the common name has some relation to the botanical name: Saururus is from the Greek words sauros (lizard) and oura (tail). The specific epithet cernuus means nodding or drooping. 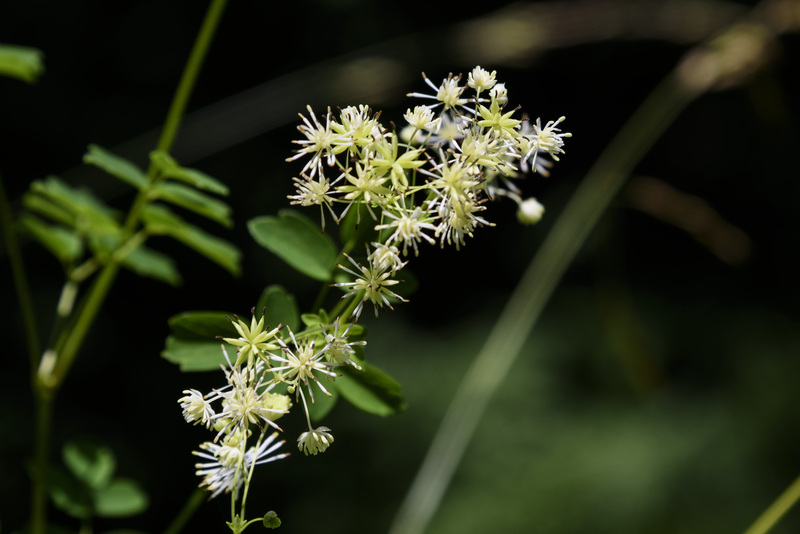 Somehow I’ve managed to miss seeing this plant in bloom for two seasons, so Sunday morning, after seeing friends posting pictures of it on various on-line forums, I took a little walk to “Erica Alley”, a rocky place on the Cabin John Trail that’s full of mountain laurels and blueberries. 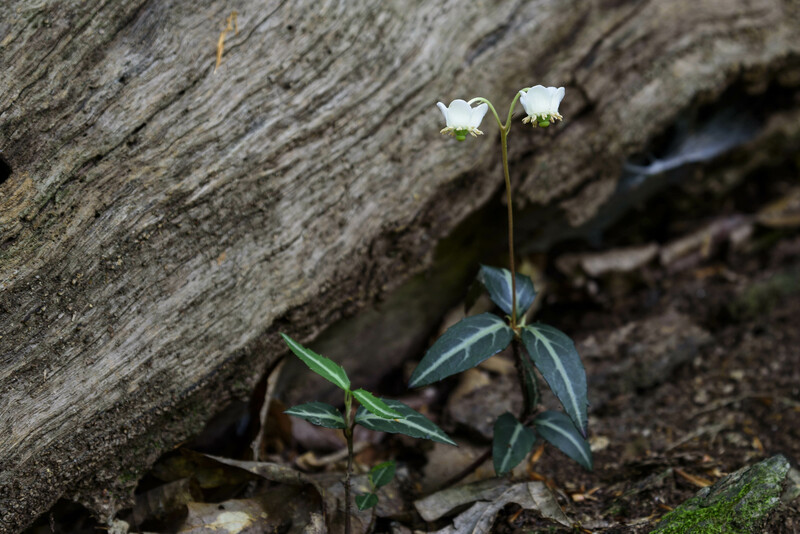 And sure enough, there it was, blooming among the leaf litter on a slope above the creek. 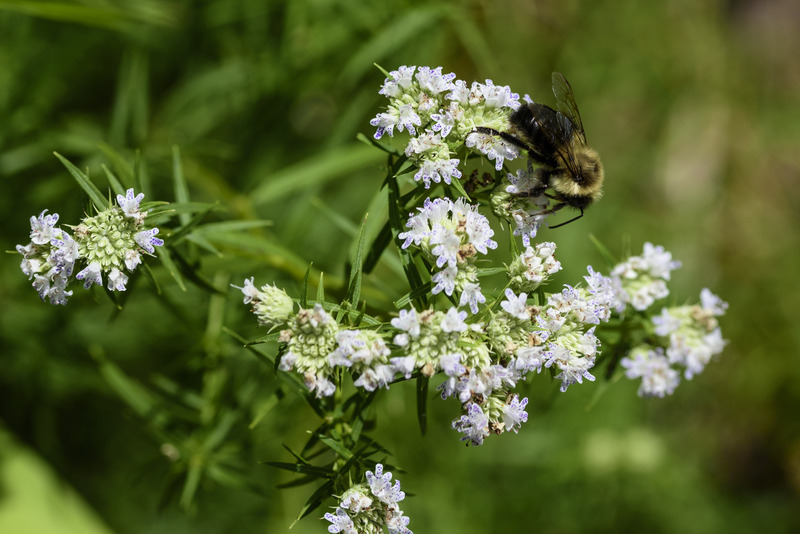 It’s endangered in Illinois and Maine, and exploitably vulnerable in New York. Chimaphila maculatum goes by many common names, including spotted/striped wintergreen, spotted/striped pipsissewa, spotted/striped prince’s pine, prince’s cone, prince’s plume, dragon’s tongue, lion’s-tongue, piperidge, ratsbane, rat’s-vein, rheumatism-root, waxflower, whiteleaf, wild-arsenic, and who knows how many others. 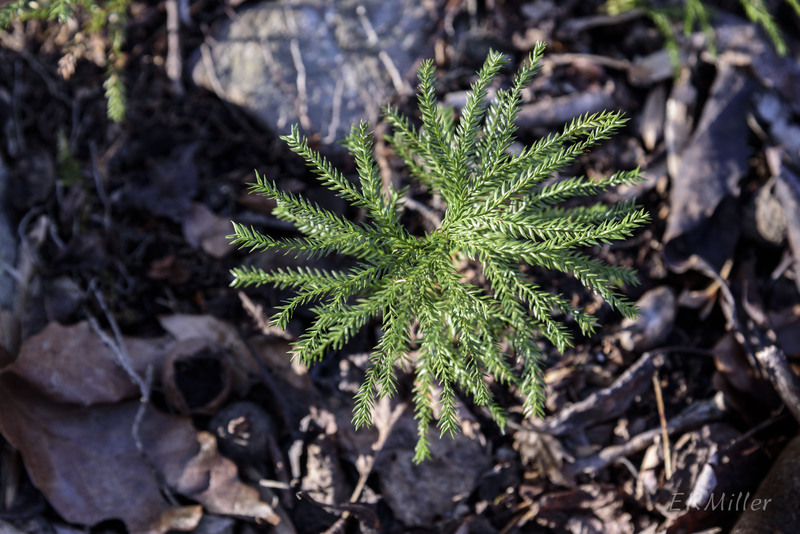 In another bit of name confusion, around here I sometimes hear it called “prince’s pine”, which sounds a lot like “princess pine” – an entirely different plant, but the two are often found growing together. Common names. What a headache. 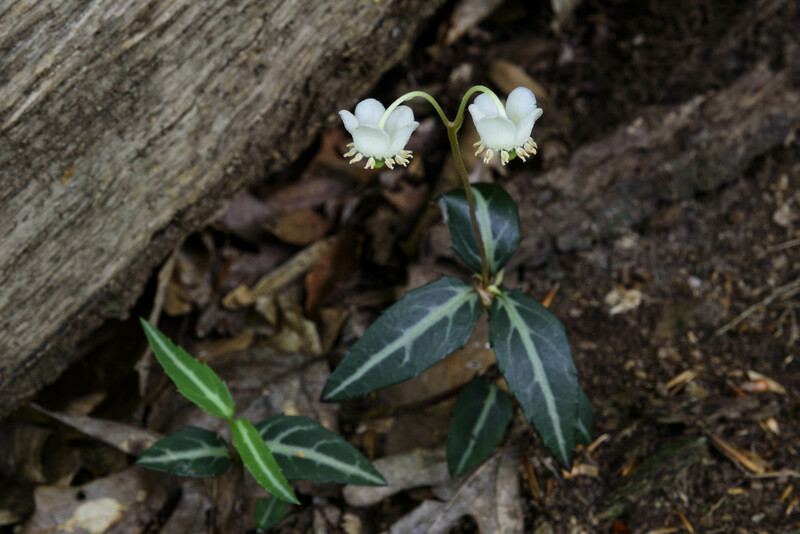 A literal translation of Chimaphila would be “winter-loving”, referring to the evergreen habit; isn’t even closely related to that other wintergreen, Gaultheria procumbens. 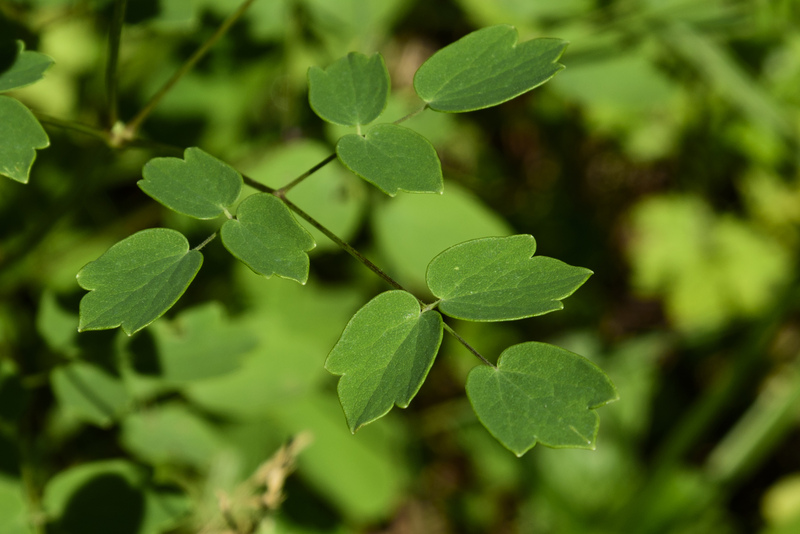 Confusingly, maculatum means “spotted”, which clearly this plant isn’t, though it is sort of striped, what with the pale green to white coloring of the mid-vein and larger lateral veins. 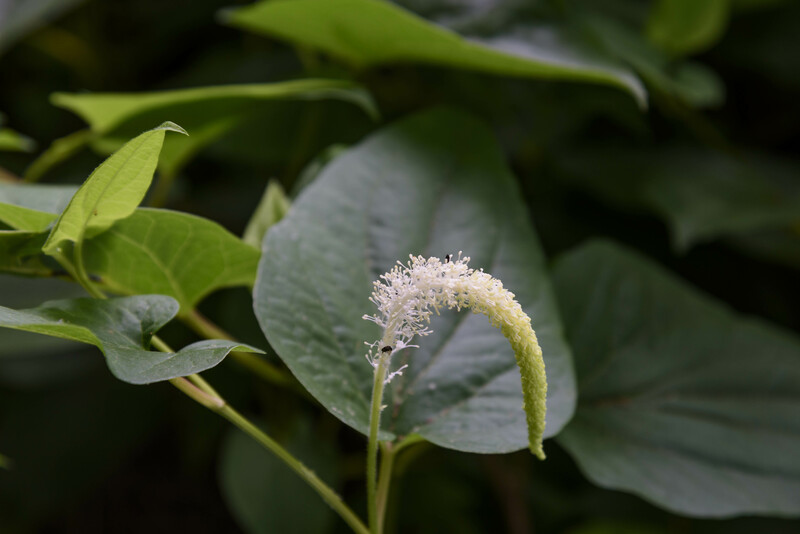 Two to five flowers (usually) are borne on a cyme. Typical of plants in the Ericaceae, the flowers have five sepals, five petals (strongly reflexed), ten stamens, and one pistil. 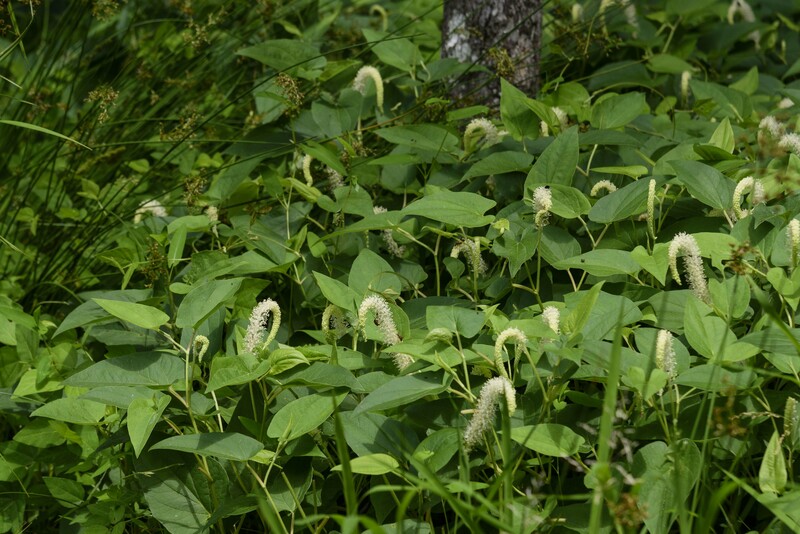 The plants spread by rhizomes, so if there’s one, there should be more a short distance away. 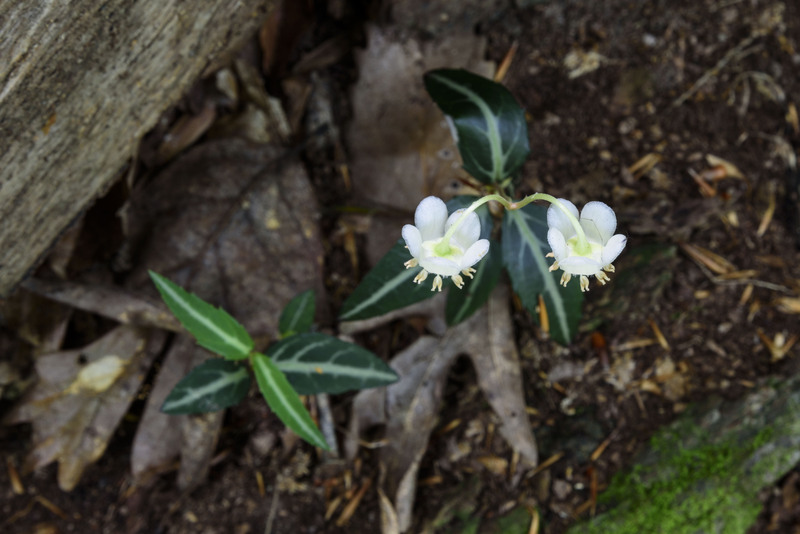 This species is currently placed in the Ericaceae (heath family), but many on-line sources and older texts still refer to it being in the Pyrolaceae. 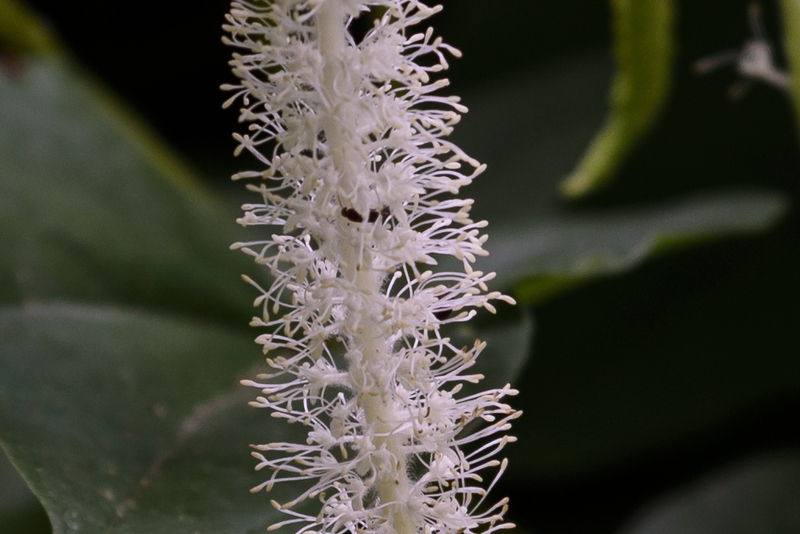 In some taxonomic systems Pyrolaceae has become Pyroloideae, a subfamily of Ericaceae. I really can’t explain why some flowers are more aesthetically pleasing than others, but this charming little thing always makes me smile. I’m so glad I saw it this year. 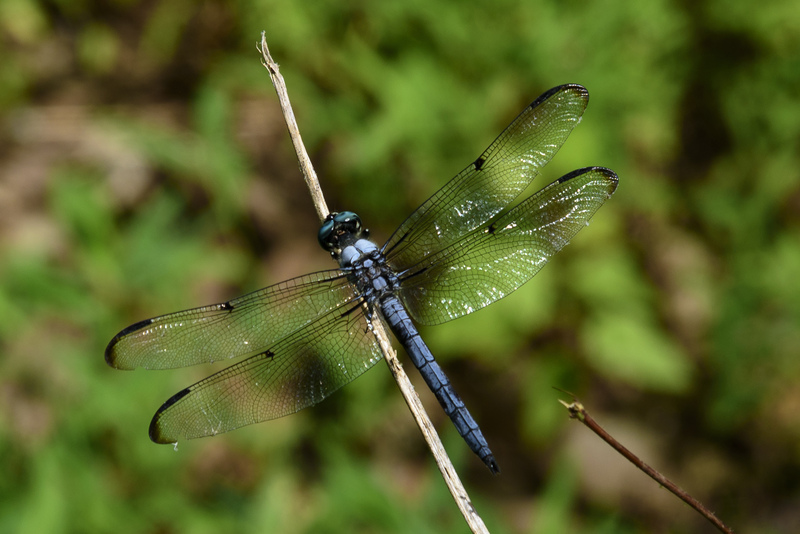 I believe this is a bar-winged skimmer or a great blue skimmer, or maybe a blue dasher but I’m not sure. I submitted an ID request to an excellent resource: BugGuide.net. Will post correct ID once I get it. Anyway it’s been awhile since I posted a dragonfly picture, so here you go.